Tensions turned ugly at the Nevada Democratic convention, with some Sanders backers throwing chairs after thinking their candidate had been cheated out of delegates. Concern spread in Democratic Party circles Wednesday that the protracted and increasingly tense primary battle between Hillary Clinton and Sen. Bernie Sanders could lead to unrest at the Democratic National Convention this July in Philadelphia. 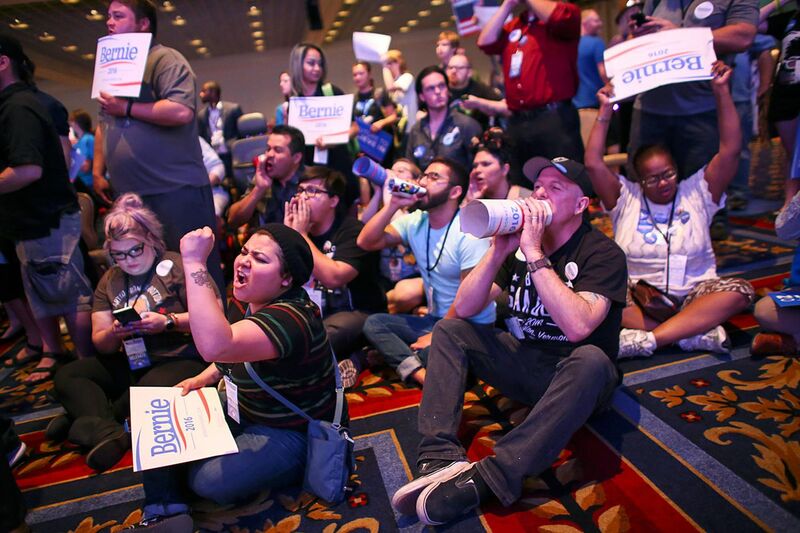 The impetus was a chair-throwing outburst at Saturday's Nevada state convention by enraged Sanders backers, who thought their man had been cheated, followed by obscene messages and death threats directed at the state chairwoman. On Wednesday, more than two dozen Sanders supporters gathered in front of the LOVE statue in Dilworth Park to discuss their plans to protest - peacefully - at the convention. The convention's CEO, meanwhile, said she expected tensions to ease before summer. "Bernie supporters, they're peace-loving hippies, and we want to keep that energy going," Bill Taylor, 30, of Northeast Philadelphia, said at the rally. "Bernie Bros, anybody trying to create violence during July, we don't want you. We are here to say there is no better place to show your Bernie love than in the City of Brotherly Love." Five Sanders groups, out of nine total requests, have applied for city protest permits during the convention, scheduled for July 25 to 28, said Lauren Hitt, spokeswoman for the mayor's office. [The city on Thursday approved four permits for Sanders rallies during the convention. The permit applications predict up to 35,000 attendees over four events July 24-28. A March for Bernie was aproved for FDR Park from July 24-28. Organizers said Wednesday they will march from Washington, D.C. to the DNC and then camp out in the park over the four days of the DNC. There will also be Sanders rallies at Thomas Paine Plaza on July 24th through 28th. Leah Daughtry, CEO of the convention, called on the campaigns to work to unify their supporters. "I'm hopeful that after California and that day of delegate-rich states, things will begin to settle down and discussions will begin about how we pull together, because we all want the same thing, which is to win in November, and to not see Donald Trump as president," Daughtry said Wednesday during a meeting with the editorial boards of the Inquirer and the Daily News. California, New Jersey, and three other states have primaries June 7. Sanders has vowed to keep fighting until the last vote is cast, though it is all but impossible for him to overcome Clinton's lead in delegates. Daughtry said that the convention's extra-tight security would prevent disturbances at the Wells Fargo Center. Protest sites will be established within the view of delegates, she said. Sanders, of Vermont, has promised to support Clinton if she is the party's nominee. At the same time, his core message tells backers that the political and economic systems are rigged against them, and that Clinton is a tool of wealthy donors. For months, Sanders supporters and a onetime candidate, former Maryland Gov. Martin O'Malley, have accused Democratic officials of skewing the contest in Clinton's direction. Nevada held caucuses in February, which Clinton won, but delegates were chosen in county conventions later, and last weekend's state convention was supposed to complete the delegation to Philadelphia. A dispute over rules erupted after 64 Sanders delegate candidates were disqualified, many because they were not registered Democrats or did not show up Saturday. Many hard-core Sanders supporters, organizing as #BernieorBust on social media, have vowed they will not vote for Clinton. A McClatchy-Marist poll this month found 25 percent of Sanders voters taking this stand. Political scientists say that the eventual number of holdouts is unlikely to be that high, in part because most are Democrats or lean toward the party, and partisan identification will supersede disappointment. In 2008, when Clinton lost to Barack Obama, 54 percent of her supporters said in one poll that they would not vote for him. Yet exit polls show nine of 10 Democrats chose Obama in the end. The same pattern happened in 2004, when Sen. Howard Dean's insurgency failed; nominee John Kerry won over almost all of his followers by November. Sanders backers are not there yet. A "D.C. to DNC" group plans to march from the nation's capital to Philadelphia, arriving July 24. Group organizer Karen Chamberlain said her hope was to have everyone gather at the Liberty Bell to form a human peace sign and hold a "Let Freedom Ring" march toward the Wells Fargo Center. "We want maybe a million bells ringing as we approach the DNC to wake up the nation to the corruption that is going on in our country," Chamberlain said. Bruce Carter of Dallas, who organizes for the Black Men for Bernie group, wore a "#BernieorBust #Never Hillary" pin. He said he was not afraid of splitting the party and opening a path for Trump to win in November. Yahne Ndgo, 44, of Germantown, has appeared frequently on CNN as a spokeswoman for the Bernie or Bust campaign. "Bernie or Bust is a way of letting people know in advance - don't, in November and December, be sitting around saying, 'Oh my goodness, if I had known, we may have done things differently,' " Ndgo said. "We're telling you right now, we will not vote for Hillary Clinton." Ndgo also is urging people to change their voter registration to the Green Party, in hopes Sanders will run as an independent or, if he doesn't, to direct people to Green Party candidate Jill Stein. Tina Davis, 59, of Chester Heights, said the news out of Las Vegas devastated her. "I cried. I sat there in bed and cried, watching democracy take such a serious blow from the very people that are supposed to be standing up for it." "I say we let the chips fall where they may. If the DNC wants to kill itself, that's their choice," said Davis, who added she would rather "chew my arm off" than vote for Clinton. One of the few people at the rally who said he would vote for Clinton was Kyle Bayne, 25, of North Philadelphia. He got involved in the Black Men for Bernie group through Facebook. "I'm always going to be on the Democratic side," he said. "I'm rolling with the punches now, but I would vote for Hillary."